Waterfalls are bewitching natural wonders and this South Asian country, from north to south and everywhere in between, is rife with majestic falls set amidst the melange of lush greenery, rugged hills and mountains. Here is our rundown of some of the best waterfalls, from serene to thunderous flows, that you should visit on your India escapade. 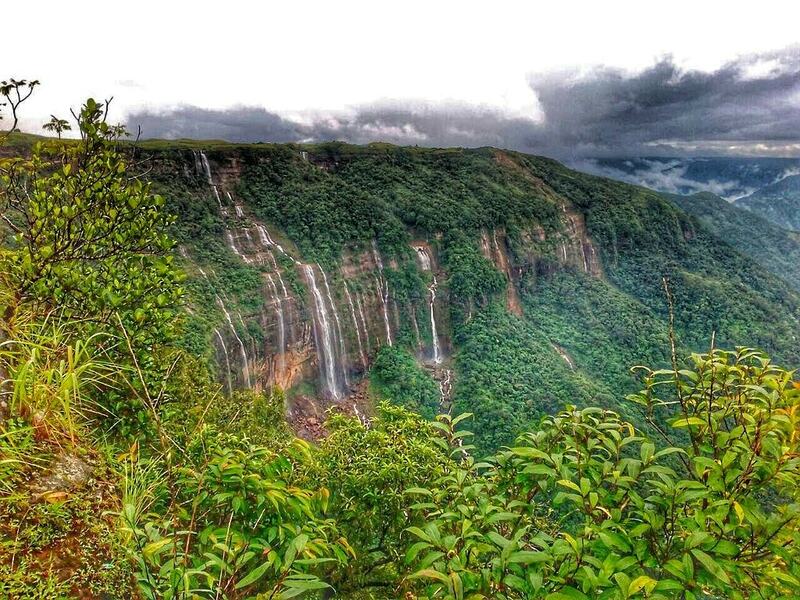 With lush greenery and water gushing down from a magnificent altitude of 253 meters (830 feet), the scale and grandeur of Jog Waterfalls leaves its visitors awestruck. 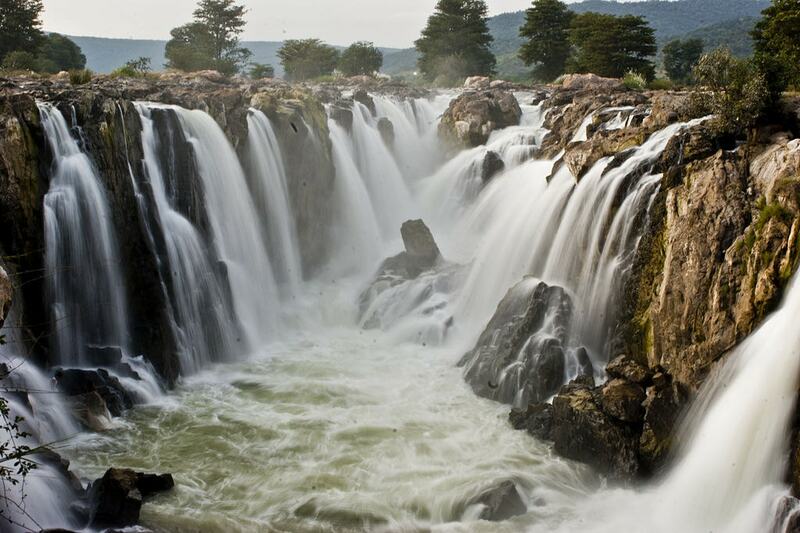 Fed by Sharavathi river, there are four cascades, namely Rani, Raja, Rocket and Roarer that make up this waterfall. To get the full feel of it, trek down to the base and jump into the Sharavathi river beneath, or hike up to the Watkins platforms for a panoramic view of the fall and its verdant surroundings. And, to witness it in its full glorious form, visit during monsoon, from June to September. This one is a spectacular fall dropping 340 meters (1115.9 feet) into the plunge pool beneath that has green shades in summer and turns pristine blue in winter. It is the tallest plunge waterfall in the country, and the falls often result in the formation of a photogenic mist down below – truly a spectacle to behold. Besides, the surrounding locales are equally mesmerising, hence a trip to Nohkalikai Falls will definitely be a memorable and Instagram-worthy one. And, the beauty is further amplified during September and October. Athirappilly Waterfalls are not the highest in India, but the largest and the most impressive in Kerala. Fondly referred to as ‘The Niagara of India’, the water plunges 24.3 meters (80 feet) down through the lush green woods and the cascade forms a panoramic stretch 100.5 meters (330 foot) wide. Visitors can take a walk into the verdant riparian forest nearby that is home to a wide variety of flora and fauna. Keep your eyes peeled for Indian grey hornbill, the Great hornbill, Malabar grey hornbill, Malabar pied hornbill, Sambar, Asiatic elephant and several water species, to boot. Besides, this fall has also made appearances in several Hindi and Malayalam flicks, owing to its immense beauty. And, this gorgeousness doubles up in June to September, making it even more worthy of a visit during these months. 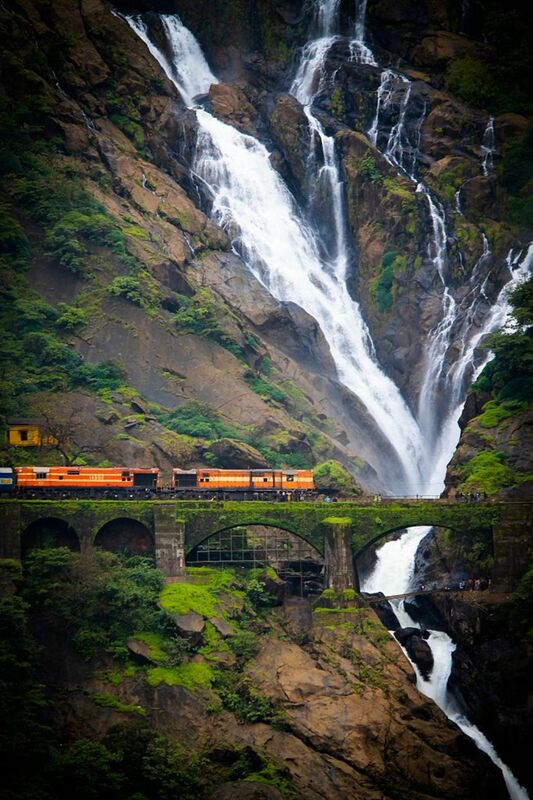 Literally translating to ‘sea of milk’, the Dudhsagar falls is a four-tiered cascade set on Mandovi River amidst the deciduous forest. This fall is a part of the Bhagwan Mahaveer Sanctuary and Mollum National Park, making it an all-day affair with plenty of activities, like getting up-and-close with wildlife, nature walks and picnicking. It plunges from a prodigious height of 310 meters (1017 feet) and forms a milky froth at the base, creating a view that will make your jaw drop. 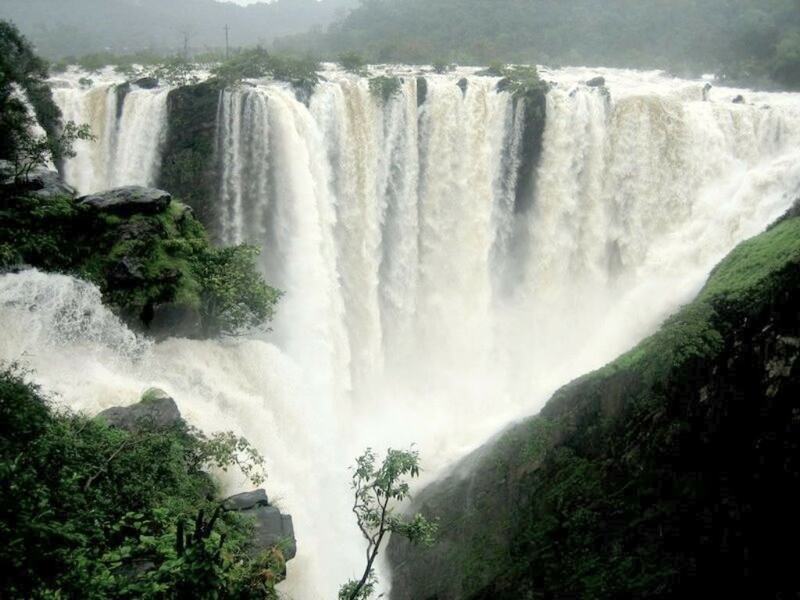 The best time to visit is monsoon (June to September) when the rains add to the falls to incredible effect. If you’re feeling adventurous, trek to the summit and you will be rewarded with awe-inspiring vistas of the falls – the trek isn’t an easy one though, but filled with natural beauty worthy of the effort. Nestled in the Vellarimala village of Kerala, the Soochipara Falls, otherwise referred as Sentinel Rock Waterfalls drops over three tiers with a strong force creating a roar amidst the silence of lush greenery and rocks, and spread over 200 meters (656 feet). And, if you’re in the mood for adventure, you can go rock climbing as this waterfall has a cliff face, or walk down to the base and swim. The name Dhuandhar means ‘smoke flow’ and that perfectly describes the fall’s smoky mist. 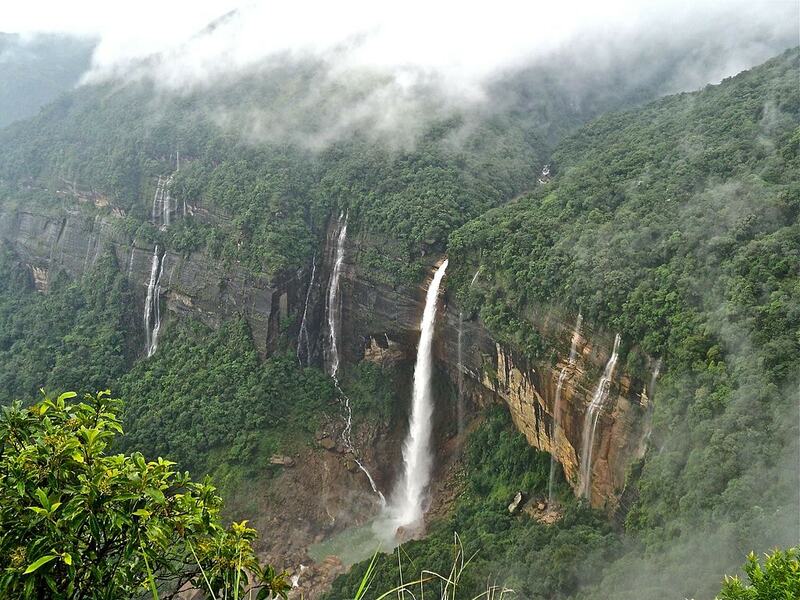 The altitude of this cascade is not high, just 30 meters (98.4 feet), but in spite of that it is well worth a trip for the abundant natural beauty and the scenic gorge known as Marble Rocks that look spectacular during sunset and moonlight with the formation of yellowish-orange and silver lining respectively. The water that flows comes from Narmada river and legend has it that a dip in the river washes away all sins. To soak in the views of the fall and surrounding beauty, it’s best to take a boat ride passing through the marble rocks. The best time to visit is monsoon, when its beauty reaches a different level altogether and creates a scenery that will leave you wonderstruck. Kune Falls is a hidden treasure nestled between two beautiful hills: Khandala and Lonavala. This waterfall drops from an elevation of 200 meters (660 feet) through three tiers, leaving a trail of glistening water. Surrounded by dense vegetation, spectacular hills and an air laced with a refreshing breeze, it makes for a great picnic spot. Visitors can bathe in the pool formed at the waterfall’s base, hike up the hill and soak in the stunning views, and if you’re dare devilish, go water rappelling. The name ‘Hogenakkal’ means ‘smoking rocks’ and that sounds about right. 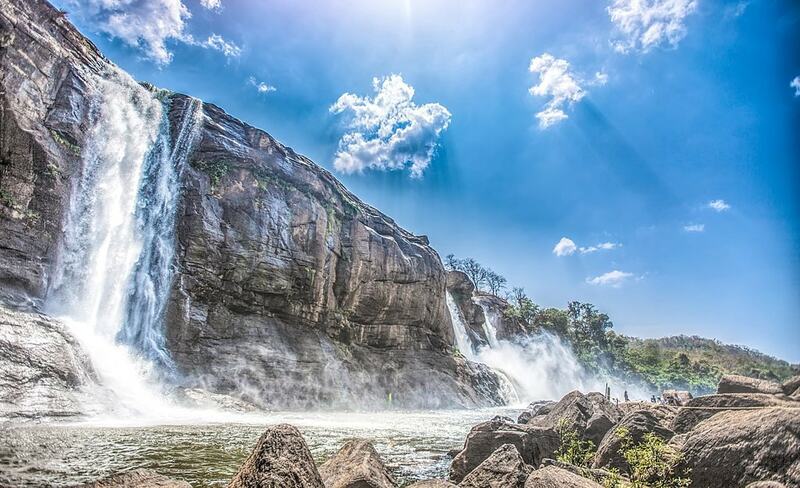 Rushing down 20 meters (65.6 feet) from the rocky edges of the cliff, the Hogenakkal Falls offers a kaleidoscope of clear water, cutting through the rocks that appear to emit smoke, thus creating a picture-perfect view. Visitors can admire its beauty from the bottom while bathing in the waters or take a coracle ride (traditional boat ride), either way the rumbling of this waterfall will be a memorable one. However, avoid the monsoon season, as the water is fierce and strong, hence no boating is allowed. What’s more, it flows through the lush green forest that has naturally grown herbs, giving the waterfall therapeutic properties. Otherwise known as the ‘Seven Sisters Waterfalls’, this is a memorable waterfall for the seven streams that fall unbroken 315 meters (1033 feet) amidst lush greenery – it creates a beautiful illusion of many falls flowing together in cacophonous unison. The notable feature is the waterhole at the base that is created by the force of the fall. The cascade looks spectacular during sundown when the rays form a beautiful palette of vibrant colours – a sight to behold. 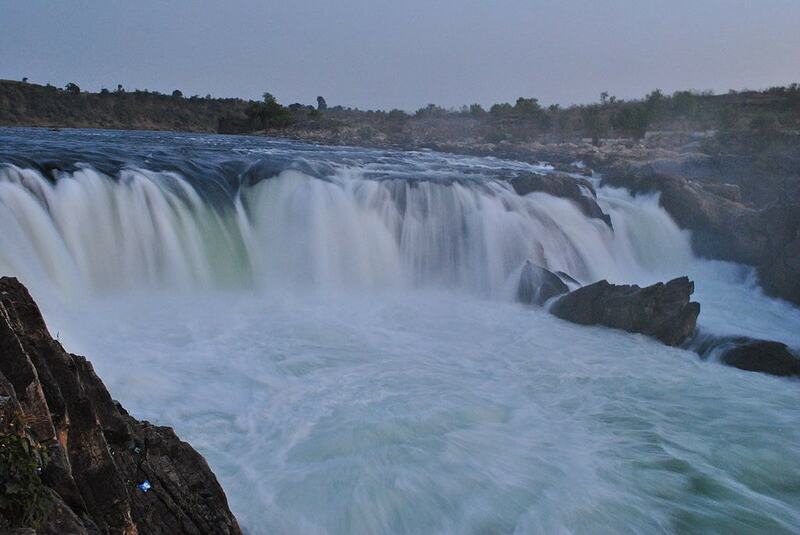 Nestled in Jagdalpur in Bastar district of Chattisgarh, Chitrakote Falls is the widest waterfall in the country, spanning 300 meters (980 feet) across a horseshoe-shaped gorge where the muddy water flows fiercely close to 30 meters (98 feet) – visually and audibly impressive. With the high current forming wild eddies and ceaseless thunder, it is not suitable for swimming, rather its sheer beauty is born to be admired. Several campsites, resorts, meditation and yoga centres, and picnic spots surround the falls, making it a perfect spot for visitors to relax and enjoy.